The Nintendo Wii hits a milestone today, adding its 500th downloadable game to the WiiWare and Virtual Console rosters - and guess what it is? If you answered "Super Smash Bros," then congratulations - give yourself a pat on the back - because you're completely correct! 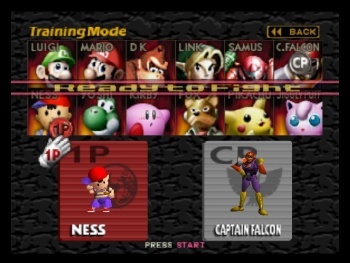 If you didn't answer "Super Smash Bros," then, uh... I can't really help you there. But yes, the grandpappy of one of the Wii's most popular titles is now available on the Virtual Console for the price of 1000 Wii Points - and hey, just in time for the series finale of There Will Be Brawl, too. All three Smash Bros games are now at last playable on a single console, in case you wanted to, you know, switch it up for ... whatever reason. In case you're not into the whole Smashing of Brothers Superly, there's also the original arcade version of Tecmo's Ninja Gaiden, also known as the Team Ninja game before they discovered modern jiggle technology, and that'll only set you back a mere 1000 Wii Points. But surely you'd rather play one of the most beloved N64 titles of all time, right? Not saying that Ninja Gaiden's bad or anything, but you can't Donkey-Kong-Punch Link in the face in it. As for WiiWare, new additions include Eco Shooter: Plant 530, a recycling-oriented shooter, party trivia game TV Show King 2, action platformer Pallurikio, and a Christmas helper app called Happy Holidays Christmas. Yeah, no offense guys, but I'll stick with the Super Smash Bros for now.